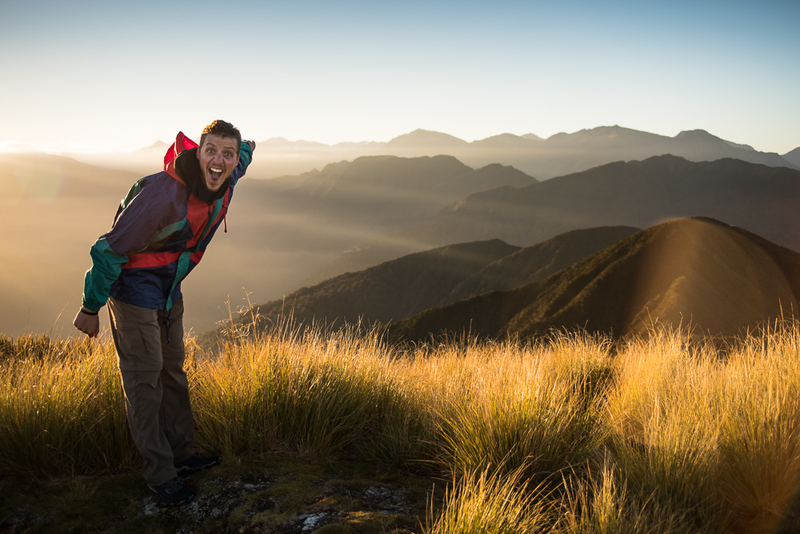 By this point, I was over an hour into my sunrise hike of Mount Tuhua near Hokitika, New Zealand. Along the way, I ran through a gamut of emotions. While my morning trek through the jungle on the edge of the Southern Alps paled in comparison to adventures my friends and idols have embarked on, it left a lasting impression that I aim to hold onto. Described by the Department of Conservation as a steep track with a 7.6km round-trip distance, Tuhua seemed like a good way to get up high for sunrise pictures now that we were finally in the Southern Alps, the proper mountains of New Zealand’s South Island. I set off from the van at around 3:45am, thinking I’d have plenty of time on top for some astrophotography or a pre-dawn show that might lead to the beautiful sunrise I was going to earn. I expected a bit of a challenge, but with a round trip distance of less than 5 miles, I figured it would be a nice warm up to the day. What I got instead was a typical New Zealand tramp. Right from the start, the trail was made up mostly of moss covered rocks, tree-root ladders, and tiny orange triangles directing which way I would go. Most of the time, this was directly up the side of the mountain. The darkness and headlamp tunnel vision added their typical eeriness to a walk in the woods. The forest decided that wasn’t enough and insisted on sending every spider in every tree on a mission to build the most spider-web trip wires ever across a trail—directly at face level. Constantly wiping away the invisible cobwebs and sweating more and more in the morning humidity, I continued up. Checking my watch, I hit 2.5km and couldn’t help but think, “Well alright, only 1km to go.” Problem was, I didn’t feel like I was very high on the mountain. Bushline still seemed far off. I brushed this off like the arachnid homes I was destroying, thinking that maybe the top itself was just a small clearing of tussock surrounded by forest just below. That’s when the trail started going downhill. Slipping and sliding on roots and mossy rocks in the dark was not what I had in mind when I set off. It was one thing to accept this challenge moving uphill, but add in the battle against gravity and suddenly, the decision to continue on (alone) bordered on dangerous. Not to mention: what the heck?! Why was I heading downhill?! I was supposed to be less than 800m to the top. After backtracking a bit to make sure the orange triangles weren’t conspiring to send me to my doom, I realized two things: the trail would go down before it went up, and the trail was definitely more than 7.6km round trip. How much further remained to be seen. Soon enough, I began to head uphill again; steeply, of course. The dim ambient light played tricks with my depth-perception. Trees that looked the size of redwoods ended up being shorter than myself. False summits that looked kilometers away, I topped out on in a matter of minutes. Finally, the summit trig, a metal sculpture that marks the summit of peaks down in NZ, peeked out from above the highest point on the ridge in front of me. I rose to shake its hand. The time just before sunrise on a high peak is the lowest point emotionally for me. The challenge of getting to the top is gone, your body has shifted from boiling hot to teeth chattering cold in a matter of minutes, and the wait. drags. on. But then the sun does rise. And that Vitamin D infused, warm, golden goodness lifts you up and carries you back to euphoria. Also, it’s usually pretty. 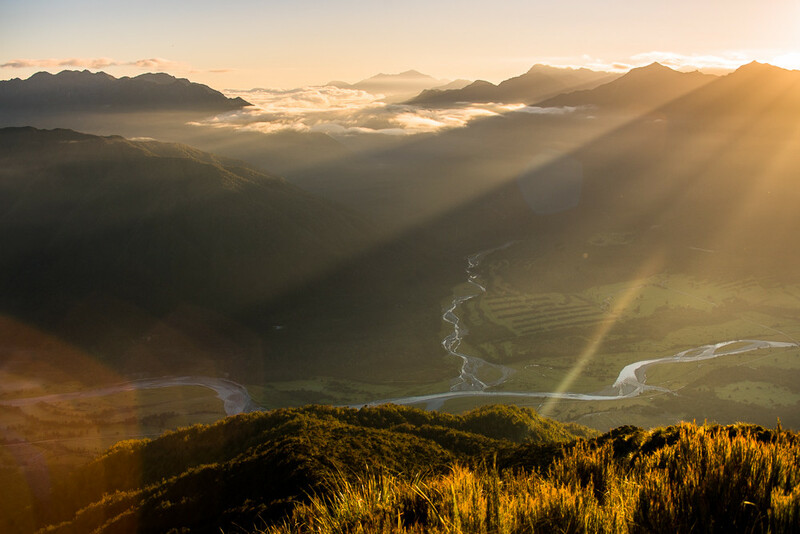 Mount Tuhua’s sunrise was no different. 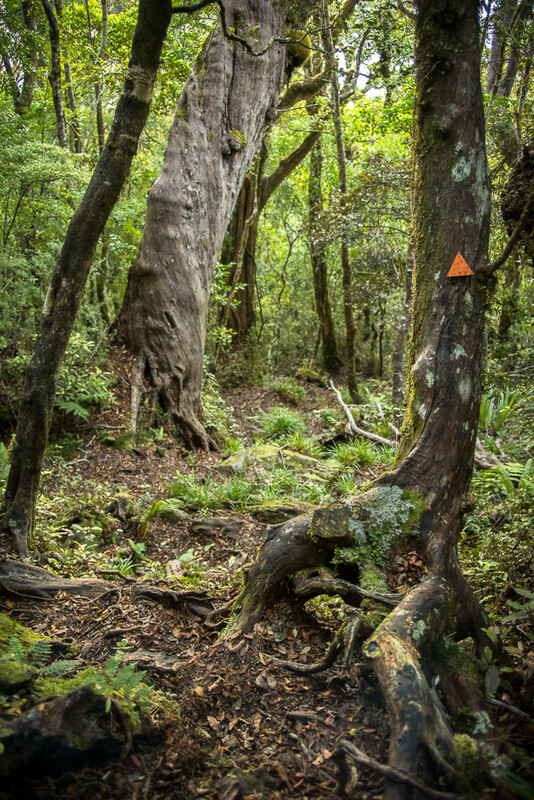 With my mood fully turned, I headed down the tussocked ridgeline and was back in the jungle forest before I knew it. Suddenly it was back to root sliding and rock hopping. I felt like Tarzan (the animated Disney version, modeled on Tony Hawk) as I made my back down the mountainside. The whole experience reminded me of a route up and down Missouri Mountain with my buddy Matt a few years back. We decided to descend the East Ridge back to a saddle toward Mount Belford, conveniently missing the part in the guidebook about how the rock on the East Ridge was likely some of the worst rock in the Rocky Mountains. After a few crumbling scrambles and (somewhat) near misses with rock fall, Matt and I looked back up from the saddle, thrilled to be out of the worst. It was our second climb together, but even in our short experience with each other, we both commented on how the other seemed to know how to handle themselves in less than ideal conditions. We started talking about “learning unteachable skills” just by being out in the mountains. How to read a scree field so you could climb up, down, or across it quickly and safely. How to shift your body on a loose boulder in that same scree field, so you could balance long enough to hop to the next firm rock and continue on without incident. It’s these lessons that you can’t simply teach another person. You just trust that they’ve learned these unteachable things at some point along the way as well. Matt clearly had and it’s why we went on to have more adventures together. * It’s a trust that can only be found out there in the elements. *Matt has since learned far more teachable skills about traveling in the mountains and has far exceeded my abilities to get to high up places; it’s rad, he’s rad. Is this the trail going up or down? Can you even tell? Back on Tuhua, I was tapping into a lot of those unteachable skills to keep myself upright. Never falling, but constantly slipping, my and Matt’s conversation kept echoing in my head. About halfway down, I realized that the best way to learn unteachable things is to make yourself vulnerable. In particular, vulnerable to discomfort. Without pushing yourself to nearly falling on your face in a scree field, you’ll never know how to rock hop like a mountain goat. Never start hiking in the dark, sweat waterfalls, reach a mountaintop with a steady breeze, you might not realize just how euphoric the sun rising can be. The list expands far beyond mountains or hiking, of course. From what I can tell, most people in their mid-20’s don’t really know what the future will hold (and more and more it appears this afflicts everyone, no matter what age or how wise they seem). I am obviously no exception and in a lot of ways, I’m probably further behind than most. But if I am going to have to learn more unteachable lessons to eventually figure it out, I guess I’d rather start learning them while walking down a jungle track, focusing on not biting off my tongue when I slip on another step. Even more, I’m starting to feel ready for the lessons to come wherever I end up next on this journey. Now is the time to open up to vulnerability and learn some unteachable skills.